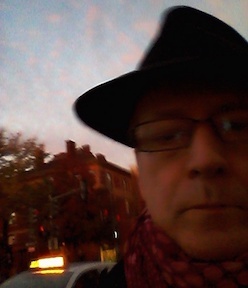 Next up will be another string of Scandinavian imports, one from Iceland (Yrsa Sigurdardottir's Last Rituals) and two from Sweden (Åke Edwardson's Frozen Tracks and Mari Jungstedt's Unspoken); but first, Havana Noir, the 17th in Akashic's Noir series, but the first based on a non-Anglo culture (anthologies from Ireland and the U.K. are the other non-U.S. books so far). 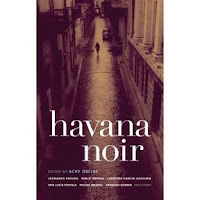 Havana Noir, edited by Achy Obehas (who also translated most of the stories) deserves attention not only as noir and as a glimpse into a culture most of us have little access to--but also for the quality of the writing regardless of source or genre. In fact, a number of the stories are not conventional crime stories (though most qualify under Obejas's own definition of noir--see quotes from her introduction in my previous post). Few have police or detectives in central roles. But most are startling revelations of the darkness at the heart of not just the Cuban experience but modern life as a whole. The best of the stories (including Obejas's own "Zenzizenic") offer complex rather than simplistic appraisals of life in Cuba (and some, also including Obejas's story, employ considerable humor). Only one story, by Carolina García Aguilera (a prominent emigre writer) is disappointingly one-dimensional in its vision of Cuba. Among the rest, whether by emigres or writers living in Cuba, include many that are moving, evocative, and significant. Miguel Mejidas's "Nowhere Man" is surreal and nightmarish experience that made me think of the stories of the great Cuban poet Virgilio Piñera. Alex Abella's detective story is an exciting tale of revolution and escape (and the only "pulp noir" story in the collection), and the story that most clearly states the oppressive context for the revolution (Batista's dictatorial, corrupt-capitalist regime), as well as American support for that regime. Several stories deal with the Chinese legacy in Havana and several others with the influence of Santería. Several show a violent underworld from the point of view of the members of that world, and all the stories demonstrate the hollow claims of the government that there is no crime in Cuba's socialist state. One story, "La Coca-Cola del Olvido" by Lea Aschkenas, turns on violent politics in the emigre Cuban community of the U.S. This is a substantial collection, over 350 pages with 18 stories ranging from barely 3 pages to over 30. Altogether, the writing is excellent, the view of Cuba unparalleled, and the contribution to the literature of noir undeniable. Havana Noir will stretch in various ways readers' notions of noir, of Cuba, and of crime writing as a limited or limiting form.